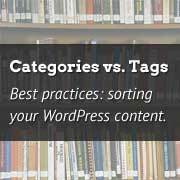 One of the most discussed topics we see when attending WordCamps and other events is what’s better for SEO: categories vs tags? What’s the difference between categories and tags? What’s the optimal number of WordPress categories? How many is too many? Is it okay to assign one post in multiple categories? Is there a limit of tags we can assign to each post? Do tags work like meta keywords? Are there any SEO advantage of using categories over tags or vice versa? We’ve seen quite a few commentaries on this subject through out the web, but we found that they were inconsistent and incomplete. If you ever had these questions, then hopefully they will be answered once you are done reading this post, so you can make adjustments to your blog if necessary. Before we discuss any of the questions listed above, we need to understand what is categories and tags. In the WordPress nomenclature, both categories and tags are known as taxonomies. Their sole purpose is to sort your content to improve the usability of your site. Meaning when a user comes to your site, they can easily browse through your content by topic rather than browsing chronologically which is how blogs were initially setup. Categories are meant for broad grouping of your posts. Think of these as general topics or the table of contents for your site. Categories are there to help identify what your blog is really about. It is to assist readers finding the right type of content on your site. Categories are hierarchical, so you can sub-categories. Tags are meant to describe specific details of your posts. Think of these as your site’s index words. They are the micro-data that you can use to micro-categorize your content. Tags are not hierarchical. For example if you have a personal blog where you write about your life. Your categories can be something like: Music, Food, Travel, Rambling, and Books. Now when you write a post about something that you ate, you will add it in the Food category. You can add tags like pizza, pasta, steak etc. One of the biggest difference between tags and categories is that you MUST categorize your post. You are not required to add any tags. If you do not categorize your post, then it will be categorized under the “uncategorized” category. People often rename the uncategorized category to something like Other, ramblings etc. What’s the optimal number of WordPress categories? Up until WordPress 2.5, there was no built-in support for tags. This led to very long category lists because people were using it to define micro-details. Tags were added to improve the usability of your site. Having that said, we believe there is no specific optimal number of categories. The optimal number varies based on the complexity of your site. However, for the sake of structure and usability, it is best that you utilize sub-categories and tags. Categories are meant to encompass a group of posts. It is always best to start with generic categories and work your way down with subcategories as your site grows. After having run multiple blogs, we have heared that blogs evolve. There is no way that you can come up with all the right categories. Chances are when starting out, you are only writing one post a day. Or maybe 3-5 posts a day. Having 30 top categories is pointless especially when some of them will only have one or two posts. You are better off with 5 generic categories that have fresh content rather than 30 top categories where the majority are not updated. Let’s take a look at an example. Say that we are starting a social media blog in 2012. We want to share how-to tutorials, news, tools, case studies etc. We can create top categories like Twitter, Facebook, Google+, LinkedIn etc. As sub categories of each, we can have tools, how-to’s, case studies, news etc. However that is a very short-term mindset, and we will run into issues in the future. What if one of the social media network dies and a new one enters the game? You will be required to add yet another top level category and more sub-categories. A much better way of structuring this social media blog would be to have top categories that are future-proof. You can have your categories like How-To’s, News, Case Studies, Tools, etc. But how would people know that it is about twitter? Well your categories are not suppose to do the entire job. This is where tags come in. Let’s say you wrote a how-to post about twitter, simply add the tag twitter. In your design just add a section called Popular Topics and control that manually with links to popular tags like Twitter, Facebook, Google+ etc. When do you add Subcategories? Let’s say that you do a case-study posts where sometimes you interviewed an expert for a specific case-study. Because there is no category called “expert interviews”, you will add that as a tag on that case-study post. If you find yourself doing a lot of interviews for case-studies and your expert interviews tag has 10+ posts in it and is consistently growing, then you should consider adding expert interviews as a sub-category of your main category “Case Studies”. Yes, you will have to go back and edit your older posts. If your URL structure is /category/postname/, then you have make sure you are using the Redirection plugin. It automatically redirects your modified posts to their new URL, so you can keep all the search engine rankings. Do I have to use sub-categories? No ofcourse not. You can always leave popular tags as tags. In our example above, almost all posts will have a tag for a specific social media network like twitter, facebook, etc. But we are not creating those as categories. The only reason why you add sub-categories is to make it easy for your users to find the content. You are more than welcome to simply add the Expert Interviews tag in your site somewhere. Remember the whole purpose of categories and tags are to make it easy for your users to browse your site. Is it okay to assign one post to multiple categories? You might read on other sites that assigning posts to multiple categories can hurt your SEO. Some say that you can get penalized with duplicate content because of that. We believe that statement is not entirely true. First of all, don’t get lost with SEO. Remember the purpose of sorting your content efficiently is to help users find it. By the nature of how top categories should be setup, you shouldn’t be able to classify one post into multiple top-level categories. For example, if your blog has three categories “Advertising, Marketing, and SEO”. Your posts often tend to fall into multiple categories. Perhaps you need an umbrella category for all three? Maybe they should all fall under Business? Or you can have one category called Advertising & Marketing. Then have SEO as a sub-category for those. There is no SEO benefits to adding multiple categories. If you think it helps your users, then you are more than welcome to add one post into multiple categories. However, if you see this becoming a regular issue, then you should consider restructuring your categories. Maybe some of your categories need to be tags. Or maybe they should be subcategories of one major category. It is mainly about making the user experience better. If you are super concerned about duplicate content penalty, then simply (noindex, follow) your category taxonomy using the WordPress SEO by Yoast plugin. If you only want to (noindex, follow) specific categories, then you can do so by editing the category themselves. Yoast plugin has the setting to override the global settings. 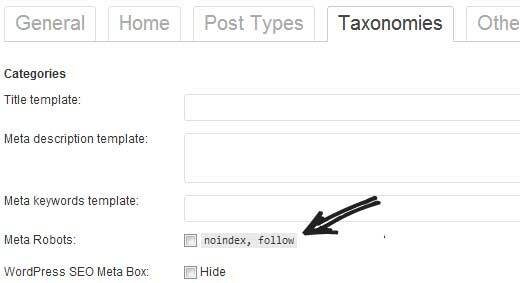 Basically when you (noindex, follow) certain thing, it tells Google and other search engine bots to follow all post links in these categories, so all posts can be indexed. However do not index the main category archives to prevent duplicate content. Short answer: WordPress allows you to add one post into as many categories as you like. Yes it is okay to assign one post into multiple categories as long as you think it helps your users. However, if you think of categories as Table of Contents for your blog where posts are chapters, then can you have one chapter in two separate sections? The answer to that question is NO. Is there a limit of tags we can assign to each post? Short answer to this question is NO. WordPress has NO limits on the number of tags you can assign to a specific post. You can add 1000+ tags if you like. However, the purpose of tags is to relate your posts together. Again think of tags as the index of your book. These are popular keywords that you can use to loosely relate your posts. This makes it easy for users to find your posts specially when they are using the WordPress search. It also helps if you are utilizing the tag archive for users. We say add no more than 10 tags to your posts unless you can justify it. For example: if you are running a movie review blog, you may add multiple tags: actor/actress names (this alone can be over 10). But chances are that you may review multiple movies that have Adam Sandler in it. But for other simpler scenarios, you should really limit the amount of tags you use. Otherwise, you may find yourself with over 10000+ tags with only 300 posts on the site. Do tags work like meta keywords? Often people mistake tags to be like meta keywords for your blogs. This is the main reason why they try to add as many tags as possible. Tags are NOT meta keywords for your blog. At least not by default. Popular plugins like WordPress SEO by Yoast allows you to use your tag values to be in the meta keywords template. But if you don’t have these plugins configured to do that, then your tags DO NOT work like meta keywords. Categories vs Tags: What’s better for SEO? The most asked question that we see being asked on this topic is: Are there any SEO advantage of using categories over tags or vice versa? The simple answer to this is NO. You should NOT look at this as categories or taxonomies. They are meant to work together. If you have read this post, then you should be able to understand the individual purpose of categories and tags as well as their combined purpose for your site’s usability. Your site is about your users not search engine bots. The goal of every search engine is to think the way users think when valuing your content. If you make your decisions based on usability, you will almost always find yourself reaping the SEO benefits. Categories and Tags are just the two default taxonomies that comes with WordPress. Most advanced sites use custom taxonomies for sorting their content alongside with categories and tags. Think of your blog as an ever evolving book. Choose the Table of Content (categories) wisely. Make sure that they are broad topics, but be cautious to not make it too vague. Use tags to loosely relate multiple posts. If you see a certain tag is becoming popular, then consider adding it as a sub-category. However, if you have to add the tag as subcategory of multiple top-level categories, then leave it as a tag. The goal is always to make the site as user friendly as possible. We hope that this article helps clear any and all confusion when it comes to the topic of categories vs tags. We would love to hear your thoughts on this matter. How do you sort your content? What best practices do you follow? Very helpful this blog. I learned many new strategies, especially good use of categories in WordPress. You did great work by sharing it. I have a WP blog. All of my postings are falling under my Home Page. Nothing is showing up under any of the categories I have across the top. I need to know how to move those posting from Home, to the category that they need to be under. Please help me. I worked on it until 3 a.m. and it was frustrating. Also I need to know how to set up a “leave a reply” after each of my posts. For the menu items, rather than pages in your menu you would want to ensure you placed the categories themselves in your menu and your posts are set as part of those categories. found this information quite useful. I’m starting out new with my travel blog and I found so many answers and information related to my queries on your site. keep up with the great work. !!! Thank you for sharing your expertise with us. It has been very helpful. As they say, knowledge is power, how true. Simple things seem to be very complicated when they are not. I am still struggling to get my word press blog to work. Wow, thanks for the insight. It’s easy to understand. It helps me solving my problem with my new blog. Thanks for posting this. Very useful information for wordpress users. Really helpful! I was in the same boat, wondering whether I still needed to tag posts. It seems a bit archaic. However, I do mark some posts under more than one category. I feel like if I had to narrow my categories further I’d have 50 of them! I do know that at least I find them helpful when I’m looking up old posts at our blog. Hi you mentioned: “Yes, you will have to go back and edit your older posts. If your URL structure is /category/postname/, then you have make sure you are using the Redirection plugin. It automatically redirects your modified posts to their new URL, so you can keep all the search engine rankings” But elsewhere in another blog, https://www.wpbeginner.com/wp-tutorials/seo-friendly-url-structure-for-wordpress/ it said that we will lose search engine ranking if we change permalink structure. Yes, you will lose search rankings if the old URL starts showing 404 error or duplicate content. That’s why you need to properly redirect URLs so that search engines can fine the content on new location and start showing it in the search results. I have a question…will it affect my search rankings at all if I use the “science” tag for all posts? If so, positively or negatively? We agree. As for the ‘science’ tag. If all your posts are tagged science then basically the science tag pages will be duplicate of your main archives with essentially the same content. This could effect your SEO negatively. I would like to ask that if you assign a post to a category and a tag at the same time, won’t that result in duplicates and affect your search engine ranking? As far as I know, it is important that I give every category and tag not only meta tags but also a description. This can be also a longer text. I planned to do so and optimize those urls for seo too (it was suggested by a seo tool) but these descriptions are usually not visible for my readers. But I thought they would be worth reading and could be a nice introduction into that cercain category. Should I make the effort in the first place and if I do so, how can I make these descriptions visible, readable for my users? Please see our guide on how to display category descriptions in WordPress. Great explanation! I find this post highly useful, clearing up the confusion I have had about the categories and tags for a long time. I recommend that the net wonderers spend some time and read it with a peace of mind if they were ever to know what “categories” and “tags” really are. For a site that has mobile phone, automobiles, banking, technology as parent categories; review, tutorials, interviews and news are being handled by tags. But the ‘news’ is always in abundant, i mean they are in hundreds. Should i make it (news) a separate parent category and select two parent categories for any post that is news as well as belong to any of the other parent categories or i should keep handling it through tag? and should on the basis of news tag, it can be submitted to google news? If we move categories into subcategories, does that break links/cause a Google penalty? I also have this question. Please advise. Thanks! If you don’t setup proper SEO redirects, then yes it can have a negative SEO impact for those pages. I am in the process of creating a website and am confused whether to create categories in my menu or pages. I understand that pages are for static information such as About me, contact me etc. If I wanted to create a menu bar containing a nutrition, treatments folder etc would you suggest using pages or categories? Thanks!! If you are planning on continuing to add new content into those topics, then categories are the way to go. Thanks for the free education. I really appreciate it. I’ll put it to use in my blogs. This is an excellent tutorial on categories, sub-categories, and tags. You have given me a better understanding on how best to structure my site. Thank you. I need to create an index that links a series of posts to one master post. Basicly, a master post and follow on update posts. Is there a way to create a Tag I can use to organize and link these that can’t be seen by users in the Tag cloud and such? simple and clear.Worked for me instantly. When I change my tag to a subcategory, won’t the permalinks change (causing confusion). And how do I go about it. Thank You. Is there any SEO benefit to displaying tags on a post? I’m aware of the SEO benefits concerning categories and of tagging each post, but I don’t know if it’s worth displaying a post’s tags *on the page*. In the section “Is there a limit to tags we can assign…” Shouldn’t the sentence “Again think of tags as the index or your book.” Should be index *of* book? I usually face a problem, like if I post an article, with a permalink xyz.com/post-title. One link is the one i mentioned, second link is through the category I choose, 3 link is from the tag I created, 4 link is from the archives page. So for every post, i end up creating more than 4 links. Is it normal? Or is it duplicate content? What is the way to make amends. What are your thoughts about having your category name also be a tag name? We’ve had WordPress template(s) created and some have a news field/area. We have our posts (which are news) listed by category, i.e. Arts & Humanities, Natural Sciences, Social Sciences. If you’re department is in Arts & Humanities (i.e. art department, theatre department, etc), we would like the arts and humanities news to display on those site. The developer didn’t make news to pull from categories; they made it to pull from tags. Their answer to the issue is to make the category names to also be tag name. I don’t believe that’s a good practice but am having a hard time finding “new” articles/guides ect. that talk about it and, of course, the developers are saying what I’m finding is 2 years old and out of date. You can have a tag with the same name as the category. In wordpress tag section of a blog article, is it a problem if I use the same 10 tag words for 50 aritcles? Yes, it could be a potentially problematic situation. Several tag archive pages on your site will have identical or similar content. This may cause duplicate content issue, which may affect your site’s SEO. In my example, I am about to write about my travels, so I will create Travel (Category) + Name of Place (Sub) and add Tags … at least one of the tags should vary, I guess, in order to avoid duplicate content issue, is that right? You should use tags based on the content you are writing. If you feel there is a new tag needed, then add it. But then I would have to click the top categories and the subcategory and then I was afraid of this counting as duplicate content. I think I understood this article of yours in that way that I can easily do so and won’t harm my SEO. My website has too many tags and categories indexed in Google. I have decided to remove all those after reading your article. Is there any plugin so a user can follow any tags? Then with the shortcode or a widget, logged-in users can see most recent posts from the tags they followed.. Thanks a lot! I started a blog 4months back and now I feel i m learning basics! Thanks for your help. Hey man, this post fits exactly to what I’m looking for. I’ve been searching about tags and categories for a long time and lots of articles says a lot of interesting things, but this besides explaining the concepts also teaches how to use these concepts in a practical way. Congratulations and thanks a lot! Extremely helpful article. Many thanks. When I merged my sites blog and its original core content into one presentation I had more than thirty categories and numerous posts were set up into a few categories each. I didn’t like it and felt it was confusing to the reader who I wanted to engage and retain so I slowly but surely removed the duplicate categorizations first. Then each of the remaining categories were examined to see if the articles fit there best or somewhere else. The end result was a sleeker and more fluid site (at least to my view) and while I still have 17 categories overall, its better than more than 30. What I am getting at is that we tend to repeat ourselves sometimes in a category label. I am actually thinking of merging my concert reviews and event reviews into one category next but that is a when time allows sort of project since there are hundreds of posts to amend. Great article. I’m developing a site for a new art gallery. To filter portfolios I would want to have categories like: Painting, Glass, Ceramics, etc. I also want to have the ability to filter by artist name (Jane Jones, Jim Smith, etc) Would you recommend have the name be a tag or does it make more sense to have each artist as a category. Or should the Artists be the categories with Glass (for example) being a tag? This is making my head hurt! Very good article! I think a lot of people tend to forget they are not writing just for SEO value, but also for the reader. I like how you explained the tags vs categories. Good Job! I have a quick question about adding names in the tags. Let’s say I want to add Oprah: Do I type Oprah Winfrey, Oprah, Winfrey, or just type Oprah Winfrey once? Do I do first name and last name comma? Or do I add all of the iterations (first name only, last name only?) Thank you! Similarly, If I want to post elderly caregiver. Do I post elderly, caregiver, and then elderly caregiver as well? Or as long as the words are there once it doesn’t matter? Thank you! The best way to deal with this is to think about what makes more sense and what your users will most likely search for. We believe that adding more descriptive tags allows you to use less tags and cover more proper forms of those words and phrases. You can use variations too if they also make sense. Thanks for the great article. I’m confused about when it is smart to use noindex, follow for category and tag archive pages. I display excerpts on these pages but I worry about the duplicate content hurting SEO. It seems like letting search engines index only the one whole blog post is ideal. Should I use noindex, follow to avoid SEO problems? Or, am I missing some reason why I should let the bots index the category and tag pages? Thank you for the post. The very answers I was looking for. Can i use Long Tail Keyword In Tag? Better or not? Hello thank you for these tips. I’ve been searching for this answer and you might like to help me with this one. Originally, I used the second permalink on my website . But later on, to hit the keyword on the URL, I decided to put the category-name on the URL of a single post. I’ve been struggling with this topic for a while now and found this post to be very helpful. Specifically, the categories versus sub-categories area. Thank you for sharing. Hi, thanks for your awesome posts. My blog has a category named Smartphones subcategories as Android Phones Windows Phones & iPhone. What i want is, my posta in iPhone or Android, also appear in my category archive “Smartphones” as when someone visits Smartphones category, they can see all posts in one place related with smartphones. What i do is, when i publish a post in Android or iPhone or Windows Phone, i also add this to Smartphones. Is this a good way. Or i should do something else. Or I should Use Windows Phone, iPhone & Android Phones as tags? I think using both categories: main category ‘S’martphones’ along with sub subcategory Android Phones & iPhone might help. Then your posts in these categories would also appear in smartphone category. My blog’s category named Smartphones has subcategories as Android Phones, Windows Phones & iPhone. What i want is, my post in iPhone or Android, also appear in my category archive “Smartphones” as when someone visits Smartphones category, they can see all posts in one place related with smartphones. What i do is, when i publish a post in Android, i also add this to Smartphones. When I publish a post in Windows Phone, i also add this to Smartphones. This is an excellent article, well done. I have a question which may help me when using tags. My wife is looking to build a website for cooking. We understand using categories such as hors d’oeuvre, starters, main course, desert, cakes. When considering adding a tag(s) to highlight topics within a category must the tag be unique, for example: There are many cakes that can be described as Chocolate Cake. There could be 50 pages/blogs with a type of chocolate cake being described. What are the implications of using the tag ‘chocolate cake’ or ‘chocolate’ on each page/blog within the same category or across other categories. You can assign the same tag to as many posts as you like. You can add more tags to describe what kind of chocolate cake it is. Hello, great article! Very helpful as I’m trying to sort out how to categorize and tag my blog. Yes, those are custom widgets. You can learn more about our site’s design in our announcement post WPBeginner v5 – New site design and what’s next? Awesome! Thank you so much for the link! Should tag be short or long? Please advice if the following implementation is correct. Depends on what works best for your site. You can use phrases to combine different keywords for better SEO visibility. Get 30% OFF on WP Courseware WordPress learning management system plugin.